Shahan Alama was a Weequay member of Cad Bane's posse during the Clone Wars. Shahan Alama was a ruthless bounty hunter who joined Cad Bane's posse after helping to kill Davtokk the bounty hunter. He, Cad Bane, Robonino, Aurra Sing, IG-86, Robonino and HELIOS-3D held many Republic Senators hostage in exchange for Ziro the Hutt's freedom in Hostage Crisis. He has one golden arm. 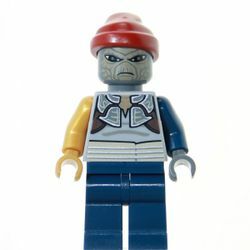 His face is very similar to Turk Falso´s - this stemming from the fact that they are both Weequay - but is a different colour, and also does not have a printed bandana. This page was last edited on 10 January 2016, at 00:29.